Dean has been employed with Tyree Ag since February 2004 and currently takes on the role as warehouse manager. He grew up near Offerle and later served as a farm hand for various producers for over 20 years. 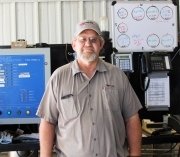 In 1993, Dean started working for ADM in Kinsley hauling fertilizer and began operating the ground spray rig in 2002. He and his wife Darla were married in 1984 and have three sons; Aaron, Jared, and William. Dean expresses his gratitude for working at such a great place and is thankful for the years he has been with Tyree Ag.